Home > OCT 2017 > Buy Gold as a Portfolio Diversification Tool Only...! Buy Gold as a Portfolio Diversification Tool Only...! The spectre of higher rates as implied by Federal Reserve’s (Fed) hawkish posture accompanied by a seeming attempt to unwind Fed’s bloated balance sheet led to a renewed strength in the dollar and declining gold prices. Odds of a Fed rate hike by December rose to about 70%, up from less than 30% a month ago. Fed’s posture & gold prices..! In September, gold prices ended below the psychological $1300 an ounce mark at $1280, a decline of 3.1% for the month. A risk-on environment as well as a high probability that the Fed will implement one last interest rate hike for this year have weighed heavily on the price of gold. The signal that an interest-rate hike in December was probable and less impactful than the overall tone which suggested that the Fed would raise rates three additional times in 2018. Fed’s hawkishness is largely relating to the urgency related to normalise monetary policy as opposed to the presence of an ideal economic backdrop. Yellen said that it would be imprudent to leave rates on hold until inflation reaches 2% this year. She also admitted that the Fed may have misjudged the recovery but insisted that rate hikes were coming and that gradually raising interest rates is the most appropriate policy approach amid higher uncertainty about inflation. As the Fed prepares to shrink its $4.5 trillion balance sheet from October, the bank could also lower its prediction for the pace of further rate hikes as price increases stay muted. The fact that the Fed members lowered their forecast for their own future Fed funds rate indicates that the Fed may again kind of undershoot what they’re predicting they’re going to do for rates. The intent may be there but it will remain data dependent and there is no certainty that US economic growth can sustain that level of tightening. Unexpected decline in August retail sales raised concern over the economy’s strength. The August decline in sales and downward revisions to the prior months make it more likely that consumption, the biggest part of the economy, will be hard-pressed to match the 3.3% growth pace of the prior quarter. Gold could quickly recover from its recent slide as the Federal Reserve may raise interest rates less than forecast because of low inflation and also there lies high probability for US tax reforms to disappoint, while global political risks abound. Tax cuts and infrastructure spending do help boost the economy. However, this requires huge funding and the more relevant question is where the money will come from? It’s premised on hope. Given the current macroeconomic scenario, we expect downsides in gold to be capped and prices to move up gradually, albeit with increased volatility. We reiterate that the real positive trigger for gold would be when markets expect Fed to be unable to normalise monetary policy and see it reverse its course at the first signs of a crisis. The world is in great disequilibrium, both with respect to the global economy and geopolitics. The fallout of global geopolitics seems to be now capping the downsides in gold. Given the macro backdrop, gold will be a useful portfolio diversification tool and help reduce overall portfolio risk. 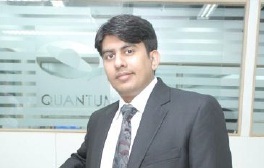 The author Chirag Mehta is senior fund manager, Alternative Investments, Quantum Mutual Fund.